“She was loyalty incarnate. With her, friendship was a holy thing like love or religion. But her ultimate loyalty was to truth, to justice, to sincerity… She was unmoved by considerations of place, power, or prestige. Her heart went out to the lowly, the underprivileged, and those to whom the community never gave the warmth of its attention.” -Dr. Glen Frank, former president of UW Wisconsin – Madison and close friend. Novelist, playwright, and short-story writer Zona Gale (1874-1938) successfully used her background and experiences in small-town Wisconsin to gain national acclaim. Gale was one of few fiction writers of her time to write contemporary stories emphasizing local color, customs and the depiction of ordinary people. No matter if she called it Friendship Village, Prospect or something else, Portage, Wisconsin, her hometown, was the setting and inspiration for nearly all of her work. Gale became the first woman to win the Pulitzer Prize for drama in 1921. 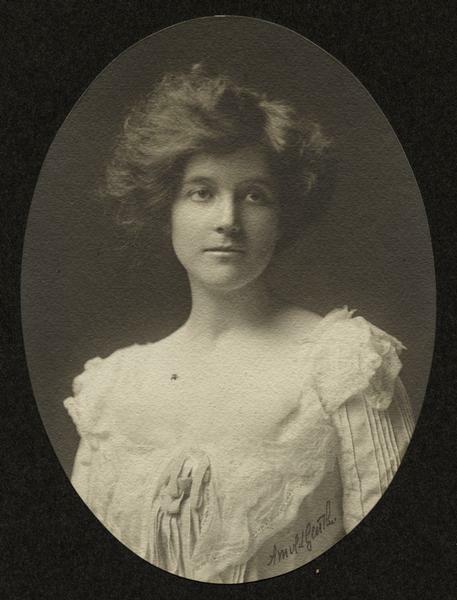 Zona Gale was born in Portage, Wisconsin, on August 26, 1874, and, with the exception of a brief time in Minnesota, lived there until she entered the University of Wisconsin. After college Gale spent six years as a journalist in Milwaukee and New York. A visit to Portage in 1903 proved a turning point in her literary life, as seeing the sights and sounds of town life led her to comment that her “old world was full of new possibilities.” Gale had found the material she needed for her writing, and returned to Portage in 1904 to concentrate full time on fiction. Gale first won attention for her short stories set in the fictional town of Friendship Village. Published in 1908, Friendship Village proved very popular, and she went on to write a series of story collections set in the town. Gale is perhaps best known for her novel “Miss Lulu Bett,” which was published to wide acclaim in 1920. Her adaptation of the novel was equally successful and won the Pulitzer Prize for best drama. After the realism of “Miss Lulu Bett,” Gale’s novels became more spiritual, creating a world where social ills could be solved through a kind of transcendentalist enlightenment. In addition to her fiction writing, Gale was an active supporter of the La Follettes and progressive causes. She was an active member of the National Women’s Party, and she lobbied extensively for the 1921 Wisconsin Equal Rights Law. Gale’s activism on behalf of women was her way to solve politically a problem she returned to repeatedly in her novels: women’s frustration at their lack of opportunities. Gale continued writing and publishing until her death in December 1938. This page’s content was sourced from the Wisconsin Historical Society.